This semi-private small group tour to the Cliffs of Moher from Dublin gives you the best of both worlds. Enjoy an early morning pick-up from your hotel, share a luxury vehicle with no more than 25 passengers and see all the sights for a great price. 07:30: We depart Dublin and make our way towards the south- west of Ireland through the beautiful countryside. Your state-of-the-art Mercedes- Benz van holds no more than 25 passengers for maximum comfort. 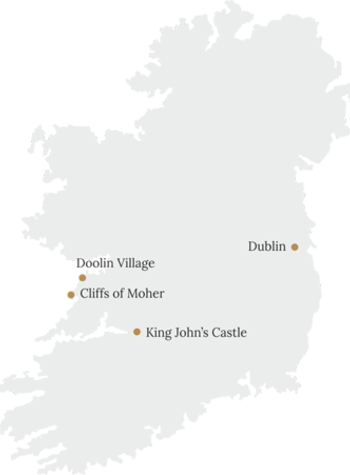 King John's Castle is widely regarded as one of the best-preserved Norman castles in Europe. It is built on an old Viking settlement and our tour will introduce us to life in Ireland during the middle ages (Entrance Fee Included). Drive up through Lisdoonvarna the home of the oldest matchmaking festival in the world and Kilfenora home of one of Ireland's most popular traditional Céilí bands. Enjoy a drive along the Wild Atlantic Way with magical views of the Aran Islands, surfing beaches of Fanore, and Galway Bay. We take you off the beaten track to the famous “baby cliffs” with the opportunity to ramble over the magical limestone landscape known as the Burren region. We lunch at the traditional village of Doolin. A popular choice is a traditional Irish pub and restaurant which has many local dishes including the famous seafood chowder, soda bread, and freshly brewed Guinness. We arrive at the world famous Cliffs of Moher, one of the world's great natural attractions where you can enjoy a relaxing walk and breathtaking views. Rising 820ft above sea- level, the Cliffs give you an opportunity to take in views of Galway Bay, Aran Islands, and rugged Connemara. You will enjoy a stop here for one hour and thirty minutes – the perfect amount of time based upon years of guest feedback. Return to Dublin with a comfort stop along the way. Sit back and relax in your spacious tour vehicle whilst you reflect on a wonderful day in the Irish countryside. The tour finishes in Dublin at approximately 19:30. Choose to drop- off either in downtown Dublin or at the same hotel you were collected from. During peak- season (May 1st - September 30th) multiple cruise ships are expected at the major ports on a daily basis. This small group tour tends to sell- out well ahead of departure for most dates within this period. Accordingly, we recommend advance reservation where possible, to avoid disappointment. © Elegant Irish Tours 2019. All rights reserved.